Worship service of a different kind – Weltherz e.V. Sarah and Joseph are very faithful Christians and also educate the children their Hope Home firmly in faith. This includes daily prayer, where the children pray alone or in groups for about 15 minutes each evening before bedtime, and regular conversations of faith, which Sarah conducts with the children. 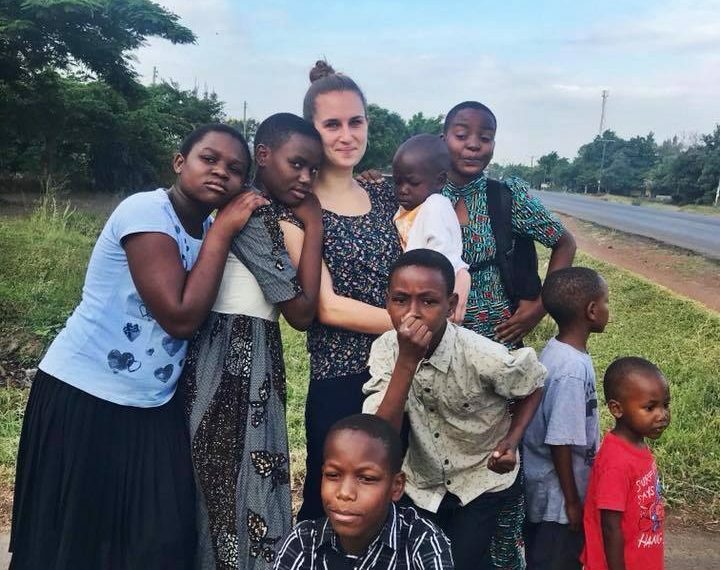 On the other hand, the Hope Home receives regular visits from the parish priest on Saturdays, and every Sunday Sarah, Joseph and the children go to church. I, too, did not miss accompanying the group during my stay in January 2018, and so I went to the Sunday service with almost 20 children in tow. Already on Saturday evening the preparations for this start, since all children are thoroughly washed in the washing area in front of the house and all outfits are laid out for the excursion the next day. Even though the service itself is only 15 km away, this means getting up at 6 a.m. on Sunday morning, creaming, brushing and dressing about 10 small children so that they are all ready to leave the house at around 7:30 a.m.. Since Sarah and Joseph themselves have no car or other means of transport, they are dependent on public minibuses, so-called “Daladalas”. Since these buses are so full that people not only sit next to each other but also on top of each other and about 15 people stand in a small corridor, it is an apparently impossible undertaking to transport all children in a bus. Joseph walks to one of the first bus stops in advance and keeps so many seats available that they all fit into one bus. This means approximately as many as 10 seats for more than 20 people, which is why there ist a lot of squeezing and stacking. The bus takes about 1.5 hours to drive the 15 km long journey – that is an enormous effort in stuffy air, heat and limited space. The most astonishing thing for me, however, was that none of the children, regardless of whether they were 13 or 3 years old, complained at any time. I spent a lot of time in these Daladalas during my stay, which are always filled to the bursting point, holding babies or children of women who were travelling alone with two or three children on my lap; I saw children squeezed in an unimaginably uncomfortable position for an hour between two adults and the back seat of the person in front. And not once have I seen a child whining or even crying. After 2 1/2 hours by bus and on foot we finally arrived at the service, which lasted 3 1/2 hours afterwards. The difference between a service in Germany and those I attended in Tanzania could probably not be greater. The church, which resembles a large pavilion, is magnificent, colourful and lavishly decorated. Before the actual ceremony begins, Christian songs are sung while standing for about an hour, accompanied by a small band and several singers on the microphone. Afterwards, the actual service lasts between one and four hours and the program cannot be compared with the services we are used to. The priest preached through the loud microphone for most of the time, in between there was an exchange of ideas with the congregation; people take notes of the sermon, cry, laugh, dance, are almost in trance. There is no trace of the stringent and disciplined course of a German service here. After the service, churchgoers usually stay in front of the church for a while.